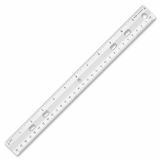 Sparco Standard Clear Ruler - Back To School! Ruler offers accurate raised, sharply defined Imperial ruling with 1/16" markings and metric calibrations. Ruler is made of rigid, lightweight, strong plastic. Design features a pencil groove and holes in center for storing in two-ring or three-ring binders.